William "Billy" Montgomery pleaded guilty to killing a Philadelphia prostitute and a Bensalem go-go dancer. On Sept. 27, 1992, Montgomery killed Ciaccio, 42, by bashing her skull 14 times with a blunt instrument after her dancing shift at the Ball Park Tavern in Bristol. Amy Moore, 25, was last seen alive on Aug. 7, 1993. Police said Montgomery had told them of meeting Moore and a man he knew only as "Pappy" or "Poppy" while looking to buy cocaine in Philadelphia. She was found beaten to death. 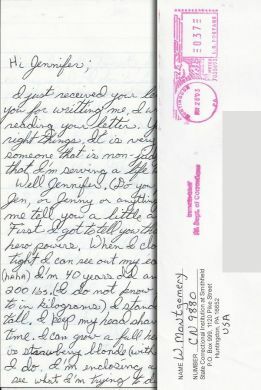 Six page (on stationary sized paper) handwritten letter from Montgomery. Letter is general content and is signed Bill. Original matching handwritten envelope is included.